Petts Wood station is on the list. It was built in 1928 and it is of rather an eccentric design. Not only are there steep steps from the two island platforms, but there are steps up to the bridge. This is a 3D Google Map of the station. After visiting and looking at the station for the best part of an hour and seeing these images, there appears to be no obvious solution to making this a step-free station. At many stations needing step-free access, the solution is to build a new modern bridge with step-free access further down the platform. 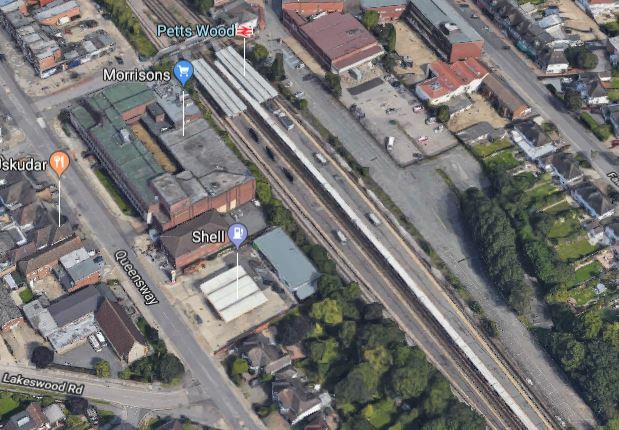 If at Petts Wood station, this were to be done, there is then the problem of connecting the new bridge to the station square and the ticket office. Morrisons supermarket and the gardens of the houses are in the way. The only solution is probably to replace the current steel bridge with a new one with lifts at each end and to each platform. But in a station that handles over two million passengers a year that would cause tremendous disruption. I will watch out for the solution that is applied at this station. It will need to be very innovative.